Prism’s professional service team meets our clients’ needs 24 hours a day, seven days a week, without delay for emergency repair needs. To ensure 24-hour-a-day service, we use an after-hours answering service company that alerts our on-duty electrician to respond without delay. During business hours, our dispatcher takes service calls and provides an assessment of project scope and arrival time frame. Clients are then assigned to either a requested electrician or to the technician closest to the location, based on customer preference. Prism’s service division also provides electrical maintenance and custom installation services across diverse industry sectors. Our technicians are experienced professional electricians, all licensed at the journeyman level or above. Facilities with complex electrical requirements are our specialty. From data centers and office buildings to hotels and hospitals, Prism’s service division provides powerful maintenance and repair solutions. 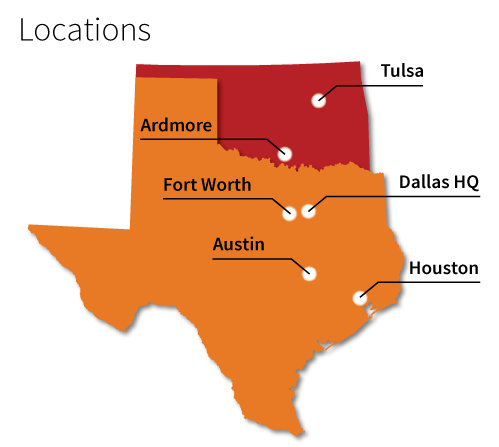 We serve our clients from six branch locations: Dallas, Fort Worth, Houston, Austin/San Antonio, Ardmore, OK and Tulsa. Healthcare, Churches, Hospitality, Office and Retail, Industrial and Manufacturing, Recreation Facilities, Property Management, Multifamily Housing. To schedule a service call, please fill out the following form.